When I first began looking into spring study abroad programs I knew I would be spending my 21st birthday in a different country. As we all know turning 21 is a big deal for most college students in the United States, and I was a little sad that I wasn’t going to be able to celebrate my 21st with my friends. However once I got to Nepal I wasn’t really thinking about my birthday any more, I actually forgot about it for a long time. While being abroad I have lost my sense of time, everything seems to move at its own pace. I was not reminded of my birthday until we received our itinerary for our Bhutan excursion, that is when it hit me that I was going to be able to celebrate my birthday in Bhutan. I became very excited, when was I going to get another chance to celebrate my birthday in a country that most people cannot visit… And even though I had only known my fellow students for a couple of months I was very excited to celebrate my birthday with them. I spent my birthday in two different cities, my birthday began in the capital city of Thimphu and then ended in Paro. We reached Paro around 5pm and that is when the cake was brought out, and to my surprise there were three difference cakes. Which seemed like a bit much to me… But it was really nice and everyone was able to have two pieces each. My birthday falls on April 1st, which we all know as April Fools Day. And even though I am the birthday girl I am not immune from any pranks, it is actually the opposite. And even though I was in a different country with different people I was still targeted. After I had finished cutting the cakes and began eating my own piece I suddenly came face to face with a hand full of frosting… One of the girls on the program with me named Megan, whom I have become very close with decided it would be funny to smear frosting all over my face. Like she had planned the frosting got every where; up my nose, in my ears, in my hear, and stuck in my eye brows… Megan and all my other peers thought it was the funniest thing, some even managed to take pictures before I was able to wipe it all off. The pictures haven’t made their way to Facebook yet so I should consider myself lucky. It was a great birthday, and I am glad I was able to celebrate it in Bhutan with my new friends. It was an adventure in its own just to get to Bhutan. First we took a flight from central Nepal to eastern Nepal, from there we drove over the border into India. Once we were in India we then took another flight to northeastern India. Once we arrived at the airport we then drove over the border into Bhutan. All together this trip from Nepal to Bhutan took about 12 hours of travel, and it was by far the most exhausting trip I have ever taken. While in Bhutan we have been traveling from one college campus to another. Each campus we visit is a part of the Royal Universities of Bhutan. We started in eastern Bhutan in the Samdrup Jongkha district, we stayed here for only two days. We then drove about seven hours on bus to Trashigang district. We stayed in the town of Khanglung for a total of five days, where we were hosted by college students from Sherubtse College. These five days went by incredibly fast. I had a lot of fun making new friends. My favorite part were the conversations I would have with the students, their lives are amazing and I could sit for hours just listening to them. After staying in dorms on campus for five days it was time to leave to Mongar where we spent one night in a guest house. The next day we were on the road again by 8am, this time we were driving to the village of Ura where once again we spent one night. After leaving Ura we drove to Bumthang district, where we stayed here for a total of three days it was just the rest we all needed. On the third day we left Bumthang and drove for seven hours to reach Punakha district. While in Punakha we stayed at the College for Natural Resources for three days. After our stay at CNR was finished we got back on the bus and drove for three hours to reach the capital city of Thimphu. This journey has been full of non-stop traveling, and even though it has been tiring and frustrating it has still been the most amazing adventure, and by far my favorite part of my trip thus far. 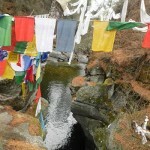 The people of Bhutan are amazing, they have been nothing but generous this whole trip. Here is Bhutan I have meant so many new friends and I wouldn’t want it any other way! Some things are the same no matter where you are in the world. This is something I have learned while living in Nepal. This past month I was given the opportunity to take part in a New Year celebration called Losar with my home stay family. The Tibetan New Year (Losar) takes place over a span of 15 days. This year the Tibetan New Year began February 11th. This holiday was like nothing I have ever experienced. Before the holiday began there were so many things that needed to be taken care of, I both watched and helped my family complete these tasks. The first task that needed to be completed was cleaning. Before the first day of the new year you must clean everything: your house, your clothes, your dishes, and even yourself. I helped by cleaning my room, washing my clothes and working with my little sisters to clean the house. While we were doing this our Amala cleaned dishes, and washed all the bedding in the house. After the house was clean we then one by one took turns showering. The second task was purchasing new things such as offerings, gifts, and new clothes. All of these things needed to be purchased before Losar began. Once the first day of Losar began you could no longer purchase new things. I needed to purchase new clothes because for the first day of Losar I was told you that needed to wear either new or nice clothes, and seems how I didn’t pack any clothes that I considered “nice” I chose to wear something new. Offerings needed to be purchased because for the first day of Losar Tibetan families decorate their shrines for Gods in which they worship. During Losar I considered these shrines to be the highlight of the house. It was interesting to see how different families decorated their shrines, of course a lot of the decorations were very similar. My family’s offerings for their Gods consisted of candy, cookies, dried fruit, fresh fruit, sugar, flour, nuts, grain, incense, juice, flowers, and money. The first and second day of Losar was all about spending time with the family. I went from having a small family of five to having a large family of fifteen, which I was excited for. It reminded me of holidays in America and how it is a time where families come together to celebrate. I was very amused by my Momo la which is Tibetan for Grandmother. Momo la can hold her liquor very well. She began drinking whiskey around 10am and continued through the whole day, and not once did she need help with anything. I was very impressed. The only thing the liquor seemed to impact was her memory, when it came time to prepare dinner she had forgotten my name. Sheand I were sitting in the kitchen along with the other women when she asked for my name. I of course answered her question with Sarah. After I told her she shook her head like she understood. Apparently in Tibetan my name means sharp ice so my name was easy for Momo la to remember, or at least that is what I thought. However not even a minute later Momo la again asked me for my name, I of course told her again and once again she shook her head. Some of the women laughed when I answered her question and I didn’t think much of it until a couple minutes later when Momo la asked me, “What is you name”? At this point I couldn’t help but laugh with the rest of the women, I answered her question one last time and then left the kitchen to prevent further questioning from Momo la. My first Losar was quite the experience, I had a lot of fun with my home stay family. They treated me like another member of the family and I wouldn’t of wanted it any other way. For the past two weeks I have been given the unique opportunity to live and be a part of a Tibetan family. This experience has been stressful, awkward, fun, and rewarding all at once. My eyes have been opened to a new lifestyle that I have been given the chance to live. I was first introduced to my Amala (this is Tibetan for mother) when she came to pick me up from my program house. She is a very sweet and small, when she picked me up she insisted on carrying my backpack and several other bags only leaving me with one piece of luggage to carry. I was lucky because my Amala was friends with another women who was picking up one of my fellow classmates Danielle, so we were able to walk to our houses as a group. My home stay house is about ten minutes from my program house, which is where I have to go every day for my classes. It was a nice relief to know that I would have a walking buddy every morning. As we walked home there was a lot of silence; my Amala speaks very little English so we weren’t able to talk very much. In a way this was nice because it allowed me to take in my surroundings. Once we reached the house that I would be calling home for the next month I was introduced to my Pala (Tibetan for father). He was very excited and happy to meet me which was nice. He also speaks very little English so this made me a little worried considering that at this point I knew very little Tibetan. My Amala and Pala showed me my new room which was fully furnished with a bed, table, small couch like something you would see in a play house, and a garbage can. It wasn’t a lot but it was certainly more than I was expecting. My new parents watched me as I unpacked a few things, they then began to speak to each other and of course I did not understand a word they were saying. They then ushered me into the kitchen where I was served tea and a snack, once I began to sip on my tea my Amala retrieved an envelope which contained several pictures of me which I had sent to them before the program began. They were very excited to share my pictures with me which made me feel extremely special. After we had gone through all the pictures I had sent them I then retrieved my own envelope which contained new pictures that I printed and brought with me. This made them very happy, we exchanged several laughs with each other while I was trying to explain the pictures to them. At this point I was extremely nervous by the fact that neither of my home stay parents spoke any English. I began to think about the rest of my stay and how I was going to manage communicating with them. After freaking out for about ten minutes a young girl entered the kitchen and took a seat across the table from me. I then learned that she was fourteen, her name was Dechin and she was going to be the little sister that I never had, and best of all she spoke very good English! After talking with Dechin for a little while I learned that there was another little girl name Tenchin who was also going to be my new little sister. This was very exciting for me, not only was I going to be able to communicate with my home stay family but I was also going to be given the chance to experience younger siblings. The first night in my new home went smoothly I was even able to get in a full nights sleep. The next day Dechin and I went out exploring which was a lot of fun, she introduced to me to street food for the first time and I can honestly say that I enjoyed it. She also introduced me to chewing gum with a liquid center that was very delicious. Day two of my home stay experience was also eventful. On the second day I taught my two little sisters how to play the card game phase ten. They brought the cards to me asking if I knew how to play the game because they didn’t. While teaching them I learned that the cards had been a gift and were given to them about three years prior. For some reason I thought this was funny and of course when I started laughing they did the same. After playing cards for a couple of hours we became a little bored so Dechin went out to get new street food for me to try, she returned with mixture that consisted of spicy potatoes and this rice shaped food that tasted like corn nuts. I didn’t like this street food as much as I had liked the food from the previous day, I only ended up eating about half of my snack. It was this same night that I decided that I never wanted to eat the street food Dechin brought me ever again. I came to this decision as I was on my hands and knees hurling into a Nepali toilet, which are nothing like toilets in America. (If you are curious about how they are different Google it…) It was only my second day with my new family and I was already sick and spending all my time in the bathroom. I was only sick for about twenty four hours but it felt like forever. I wasn’t even able to keep water in my system it all came out just as fast as it went in. Living with this new family as been an amazing experience and I am enjoying every minute of it. I only have a couple more weeks with my home stay family but I know that we are going to stay in touch for many years to come. There are several things that I have learned from my pre-departure experience. I never thought there would be so many things to take care of before I left! I have been prepping from my trip for about four months and it hasn’t hit me that I am about to leave the country for the first time in my life. As I get closer to my departure date I am becoming more and more nervous, there are so many little details that are going into this trip such as shots, student visas, and health insurance. I was glad I started my prepping early. I had almost everything taken care of and then it came time for me to apply for a student visa for India. At first it was just another application that I need to fill out and then mail in. Except this application also required me to mail in my passport. The application said to give it about 2 weeks to be processed so I was sure to send it in by the January 8th, thinking that would be enough time for my trip which started on January 27th. The student visa process was simple enough up until my application along with my passport and a money order was lost in the postal system. Fed-ex had lost tracking on my package! According to them I never sent it and it was still waiting to be shipped out. It was about a week and a half away from my departure date when I discovered my package had been lost. At first I wasn’t so worried because I assumed it would be delivered soon and everything would work itself out. Well I was wrong, and you should never assume. It was a week before my departure date when I decided to take matters into my own hands and begin working on plan B. Plan B consisted of four steps. Step one required me to obtain a new passport, this of course was expensive because I had to expedite it. Step two: Make an in person appointment with the San Francisco Consul. Step three: Rent a car Thursday, January 24th, which was also expensive. Step four: drive all the way to San Francisco Thursday night in order to be on time for my Friday morning appointment at 9:30am. This trip to San Francisco was extremely stressful because it was not a guarantee that I would be able to receive my student visa the same day, which would have been terrible considering that I was leaving two days after my appointment. However, I was able to receive my visa the same day, I was extremely grateful because this meant that I was going to be able to leave from my trip Sunday morning like planned. If I hadn’t driven all the way to San Francisco I wouldn’t have been able to leave for my trip on Sunday, January 27th. I would’ve had to delay my flight which was the last thing I wanted to do. I was able to get everything taken care of, in the beginning it was not that bad, getting shots and medicine where easy things to take care of because I was able to take care of them in person. I should have given my student visa more time due to the fact that it was being shipped through the mail, and because I didn’t give it enough time I only made it harder on myself and had to rush at the last minute.